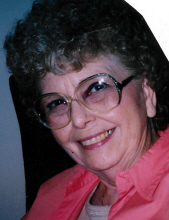 Rachel Nadine McKisick, 88-year-old Vinita resident, passed away on Wednesday, March 13, 2019 at the Heartsworth Nursing and Rehabilitation Center in Vinita. She was born on June 26, 1930 in Dover, Missouri to Dan Wesley and Bessie Katherine (Pendleton) Burk. Nadine was a graduate of Big Cabin High School. In 1947 she married Russell McKisick, residing in the Big Cabin area for many years. Nadine had worked at Vinita Flag and Apron, Dr. Jones dental office and then for 17 years at Wal-Mart in the Fabric Department. She was a member of the Big Cabin United Methodist Church and the PEO Club. Nadine loved to cook, decorate for the holidays, listening to Elvis, and dressing fashionable. Family who preceded her in death include; her husband Russell, her parents, siblings, John Burk, Vincent Burk, Florence D’Ambrosia, Elizabeth Tegge, and Jeanette Miller. Her surviving family includes; her two daughters, Jimmie Lou McKisick of Vinita, Karen Sue Troyer and husband Neal of Grove; a sister, Ruth Dirickson of Claremore; five grandchildren, fourteen great-grandchildren and one great-great-grandchild, with another on the way. The family will receive friends from 6-8 PM on Friday, March 29, 2019 at the Burckhalter-Highsmith Funeral Home Chapel. The celebration of life service will be held on Saturday, March 30, 2019 at 2:00 PM, at the Big Cabin United Methodist Church, with Pastor John Arthur officiating. Interment will follow at the Big Cabin Cemetery. Friends may give to the Big Cabin United Methodist Church. Arrangements are by the Burckhalter-Highsmith Funeral and Cremation Service of Vinita. Online condolences may be made at www.highsmithfh.com or on our Facebook page. To send flowers or a remembrance gift to the family of Rachel Nadine McKisick, please visit our Tribute Store. "Email Address" would like to share the life celebration of Rachel Nadine McKisick. Click on the "link" to go to share a favorite memory or leave a condolence message for the family.